All investigators of the Chicago fire and its devastating regional counterparts rely on human testimony. But how should we view such testimony when it suggests things that are not currently believed? Good science will not ignore witnesses when, in unison, they suggest new lines of investigation. On the evening of October 8, 1871 devastating fires erupted at virtually the same moment in three different states in the region of the Great Lakes—Wisconsin, Illinois, and Michigan. 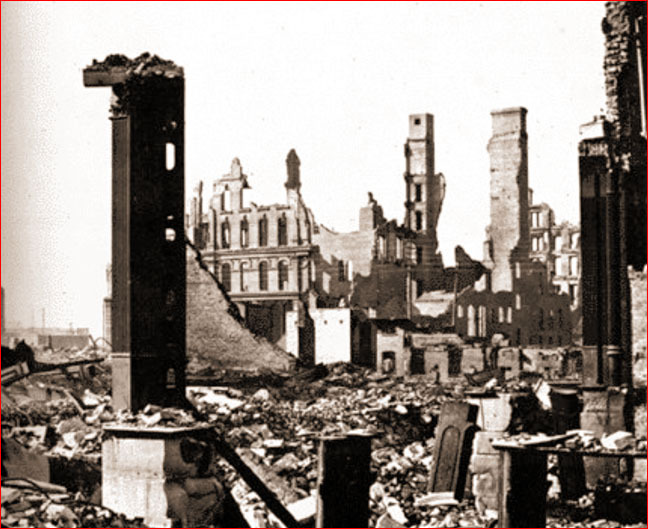 The outbursts included the notorious “Chicago fire”, but also an even more devastating fire in Wisconsin, the worst in U.S. history, covering some 400 square miles. At the same time, wildfires also erupted across much of Michigan. In his book Ragnarok: The Age of Fire and Gravel, published in 1883, Ignatius Donnelly proposed that the simultaneous outbursts were no coincidence; they were the effect of our Earth meeting up with a fragment, or fragments, of comet Biela, a body that had disintegrated a few years earlier while on an Earth-threatening path. For many of the witnesses it seemed as if the biblical "last days" had come. Though well accustomed to wildfires, they had seen nothing like this before. "They could give no other interpretation to this ominous roar, this bursting of the sky with flame, and this dropping down of fire out of the very heavens, consuming instantly everything it touched". Donnelly notes that many of the victims were found in open spaces with "no visible marks of fire nearby" and "not a trace of burning upon their bodies or clothing". Many were found huddled together "in what were evidently regarded at the moment as the safest places, far away from buildings, trees, or other inflammable material, and there to have died together". "Much has been said of the intense heat of the fires which destroyed Peshtigo, Menekaune, Williamsonville, etc., but all that has been said can give the stranger but a faint conception of the reality. The heat has been compared to that engendered by a flame concentrated on an object by a blow-pipe; but even that would not account for some of the phenomena. For instance, we have in our possession a copper cent taken from the pocket of a dead man in the Peshtigo Sugar Bush, which will illustrate our point. This cent has been partially fused, but still retains its round form, and the inscription upon it is legible. Others, in the same pocket, were partially melted, and yet the clothing and the body of the man were not even singed. We do not know in what way to account for this, unless, as is asserted by some, the tornado and fire were accompanied by electrical phenomena". It seems the idea that Mrs. O'Leary's cow triggered the conflagration in Chicago did not withstand investigation. Speaking of O'Leary's barn, the fire marshal testified: "We got the fire under control, and it would not have gone a foot farther; but the next thing I knew they came and told me that St. Paul's church, about two squares north, was on fire". They then checked the church-fire, but--"The next thing I knew the fire was in Bateham's planing-mill". A writer in the New York "Evening Post" says he saw "buildings far beyond the line of fire, and in no contact with it, burst into flames from the interior”. "The flames that consumed a great part of Chicago were of an unusual character and produced extraordinary effects. They absolutely melted the hardest building-stone, which had previously been considered fire-proof. Iron, glass, granite, were fused and run together into grotesque conglomerates, as if they had been put through a blast-furnace. No kind of material could stand its breath for a moment." "The huge stone and brick structures melted before the fierceness of the flames as a snow-flake melts and disappears in water, and almost as quickly. Six-story buildings would take fire and disappear for ever from sight in five minutes by the watch. . . . The fire also doubled on its track at the great Union Depot and burned half a mile southward in the very teeth of the gale--a gale which blew a perfect tornado, and in which no vessel could have lived on the lake. . . . Strange, fantastic fires of blue, red, and green played along the cornices of buildings". "Accompanying the firestorm and the wind was a rain of red hot sand. It was not clear to those eyewitnesses who survived their ordeal where this sand came from. It must have been raised from the earth by the incredible winds, but from where? There was sand on the beaches, but the beaches lay to the east, and the wind was blowing from the west and the south. There was no sand on the floor of the forest nor on the farmlands of Wisconsin". Waskin also mentions incredible "balloons of fire" reported by many people, including one family that lived between Peshtigo and Green Bay. "The onslaught was so sudden that the family could only run to the center of an immense clearing on their farm where nothing combustible stood. They hoped to be safe, several hundreds yards from structures or trees. "When the fire came, rushing on all sides of them, it did not in fact touch them. But eyewitnesses saw them die. A great balloon of fire dropped on them – father, mother, and four children. They were incinerated in an instant. Almost nothing was left of them". "Many survivors described these great balls of fire falling from the sky. The whole sky was filled with them; round smoky masses about the size of a large balloon, traveling at unbelievable speed. They fell to the ground and burst". Waskin says that a brilliant blaze of fire erupted from the balloons as they landed, instantly consuming everything they touched. Also noteworthy were the reports that the flames erupted from the basements of the stores when there was "no sign of fire in any other part of the building". And the basement fires burned with a strange light, "as if whisky or alcohol were burning". 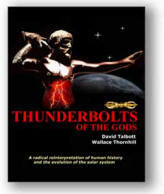 As something of a footnote to this article, we note a contemporary report claiming that “The first (and most startling) piece of evidence is the recent discovery of a 26.5-kilogram carbonaceous chondrite meteorite on the shores of Lake Huron – ‘ground zero’ of the astral bombardment. This report, by Ken Riell, whose claims follow the work of Donnelly and Waskin, suggests the meteor is of the same composition as the incoming object in the Tunguska event in Siberia -- 1908. "Weather historians, using archives as a baseline, and adding information from recent decades, now offer a plausible theory. Meteor showers in Autumn are common in the upper great lakes. In recent years these showers have left burning chunks scattered over the entire region, some large enough to break through the roofs of homes and out buildings, starting fires in dry fields and wooded areas. With the tinder dry conditions present throughout the entire region on the night of October 8, 1871, such a meteor shower would easily have started what seemed like spontaneous fires in numerous places of Wisconsin, Michigan (upper and lower), and Illinois (the Great Chicago Fire). With the continuous thick smoke from smoldering smaller blazes already blanketing the land, and the unusually hot weather of that time making residents seek shelter inside their homes early in the evening, the meteors that entered the Earth's atmosphere could not easily be seen. This certainly would account for the sudden eruption of numerous blazes over the vast area at exactly the same time." Tornadoes are a slow electric discharge phenomenon. The ionized trails of cometary debris, descending through the ionosphere to the lower atmosphere, produces "lightning conductors" to allow various forms of "megalightning" to descend to the ground. One of the manifestations of a powerful direct discharge between the ionosphere and the Earth could well be a tornado, in which the usual swift lightning strike is replaced by a slower discharge. Powerful electromagnetic forces generate a devastating "charge sheath vortex" that slows the discharge while spreading the devastation on Earth. As in the Tunguska event, the appearance of fireballs or electrically discharging debris, along with associated lightning manifestations from a clear sky, would be expected as an external body penetrated Earth’s plasma sheath. An electrically charged fragment of a comet nucleus will undergo explosive electrical fragmentation before reaching the Earth's atmosphere. The electrical model of comets envisions these bodies being formed by the same processes that created asteroids. Most, if not all, are as rocky as asteroids. The result of their fragmentation will be a meteoric shower of granulated silicates, or sand, mixed with flammable gases and electric discharge phenomena – a 'biblical' rain of fire and sand. It is well established that comets discharge carbon compounds that would be flammable in the Earth's oxygen atmosphere. Gaseous balls of fire would combine with various weird manifestations of megalightning, reaching through the meteoric shower of dust to the ionosphere, almost 100 kilometres above the Earth. The spectacle would be beyond normal experience. In addition, near the Earth, ball lightning could be expected, given the extreme electrical conditions—and the presence of ball lightning is surely the plausible explanation for descending “balloons” with the power to incinerate objects they strike. Electrical discharges would take place between metal objects inside buildings, igniting any flammable materials. The same would hold true for the hapless man found with melted coins in his pocket but clothes intact and no other signs of burning. There is, in fact, no other natural explanation for this enigma. This is the usual description of a glow discharge from sharp edges of rooftops, seen in the midst of powerful electrical storms. It is called "St. Elmo's fire". The different colors of the flames are due to the metallic ions sputtered from the surface material. Plasma discharges can be used to melt anything. Industrially, plasma torches are used to destroy the most refractory materials. "…the basement fires burned with a strange light, "as if whisky or alcohol were burning". Whisky or alcohol burns with a ghostly blue light. Similarly, electrical glow discharges from grounded metallic objects or electrical wiring in the basements of buildings would emit a flickering, eerie blue light. Any trapped flammable gases formed in the basements would be ignited by the discharge, resulting in explosions. Our purpose here is not to suggest a definitive answer to the “Great Conflagration”. But the cost of ignoring evidence should be obvious. The moment one entertains the electrical vantage point, if only to compare the explanatory power of alternative views, the most incongruous elements of the story become predictable features. And who could deny that this ability to resolve paradoxes is the mark of a hypothesis that deserves consideration?